The Ukrainian parliament adopted a motion to impose martial law for 30 days, something that Ukraine avoided doing even when Russia annexed its Crimean peninsula or sent in clandestine troops and weapons to the war-torn east. KIEV, Ukraine (AP) — Russia on Tuesday began prosecuting the crew of Ukrainian navy vessels captured over the weekend in a confrontation off Crimea, putting some of the seamen on camera, where they confessed to intruding into Russian waters. Ukraine demanded that Russia stop using “psychological and physical pressure” on the sailors, as tensions between the two neighbors escalated. Ukraine’s top diplomat called the men “prisoners of war,” telling The Associated Press that displaying them on TV was a crime. Russia and Ukraine have blamed each other for Sunday’s clash in the Kerch Strait, which links the Black Sea and the Sea of Azov. The incident has drawn strong criticism of Russia by the United States and its allies and fueled fears of a full-blown conflict in eastern Ukraine. Ukraine’s parliament on Monday adopted a motion by President Petro Poroshenko to impose martial law for 30 days in parts of the country — a measure that Kiev avoided even when Russia annexed the Crimean Peninsula in 2014 or sent clandestine troops and weapons to separatists in eastern Ukraine. “The introduction of martial law could potentially raise the threat of escalation of tensions in the region of conflict,” he told reporters. In Sunday’s confrontation, Ukraine sent three small naval vessels from their Black Sea base in Odessa to Berdyansk on the Sea of Azov. The Russian coast guard blocked their way near the Kerch Strait and at one point rammed one of the Ukrainian vessels to keep it from passing through the narrow waterway. The ships had spent tense hours maneuvering until the Russians opened fire and seized the Ukrainian vessels and crew. Russian state television broadcast separate interviews with three of the seamen, who said that the Russian coast guard repeatedly warned them that they were violating Russia’s territorial waters and urged them to leave. It was not clear if the men were talking under duress, but one was clearly reading from a script on camera. Ukraine’s National Security Service, or SBU, demanded that Russia stop using “psychological and physical pressure” on the men — an apparent reference to the interviews. “It’s not a political issue here, because we can have an argument about the legal status, but it’s about simply concentrating on protecting them and helping them,” Klimkin said. Klimkin said the use of force against the Ukrainian vessels was a “show of strength” by Russia intended to buttress Russian President Vladimir Putin’s falling approval ratings. 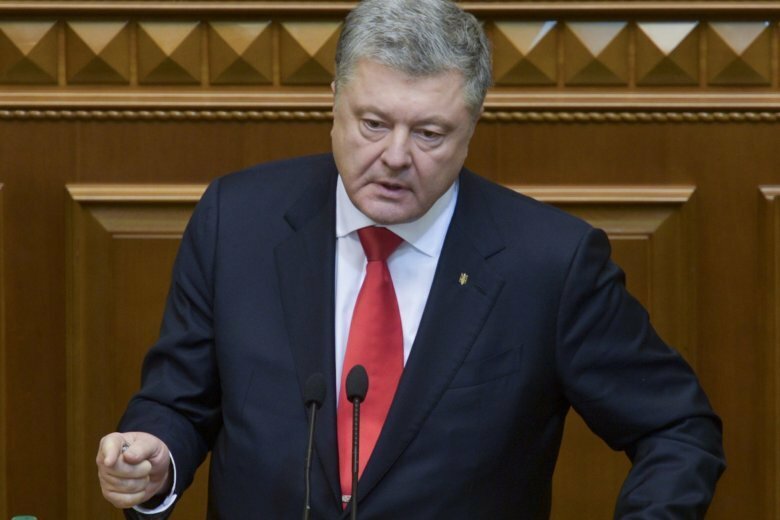 “He needs a permanent crisis with Ukraine,” he told the AP. But Russian officials and state media cast the incident and the imposition of martial law as an attempt to shore up Poroshenko’s own sagging popularity ahead of a presidential election in March. NATO on Tuesday emphasized its “full support to Ukraine’s sovereignty and territorial integrity,” noting there is no justification for Russia’s use of military force against Ukrainian ships. It urged Russia to release the Ukrainian seamen and vessels promptly. Putin spoke to German Chancellor Angela Merkel early Tuesday, expressing “serious concern” about what martial law in Ukraine might entail. German Foreign Minister Heiko Maas said Berlin has urged both Russia and Ukraine “to show the greatest possible restraint” and suggested that Germany, France, Russia and Ukraine could work together to resolve the tensions. Lavrov rejected that offer, saying he did not see “a need for any kind of mediators.” He spoke after meeting with French Foreign Minister Jean-Yves Le Drian, who appeared to soften his criticism of Moscow. France’s Foreign Ministry said shortly after the incident that “nothing justifies” Russia’s use of force, but after long talks with Lavrov, Le Drian blamed the standoff on the “high level of militarization” in the region and avoided pointing the finger at Russia. Vasilyeva reported from Moscow. Yuras Karmanau in Minsk, Belarus, Vladimir Isachenkov in Moscow, Angela Charlton in Paris, and Kirsten Grieshaber and Geir Moulson in Berlin contributed.